Do you offer team memberships for my company? Yes! We offer great savings on team memberships. This enables multiple people in your business to undertake the training at their own pace, each with their own account, tracking their own progress and enabling effective CPD. Check our team pricing page for details. I don’t want to subscribe on a monthly basis. Are there other options? If you just want a specific course or masterclass you can buy it outright for a fixed fee and keep it for life. However, for a low monthly subscription you can access the entire Academy library – including frequent updates and every new Masterclass and Course – with our AAA Subscription available in both monthly and annual options. Do you offer an annual or quarterly subscription rather than monthly? At the present time we offer both monthly or annual subscription options. No. You can cancel your subscription at anyt ime and you'll enjoy continued access until the end of your paid period. Can I share my purchases and / or subscription with others? No. Purchases and subscriptions are intended for an individual user only. If you want to provide access to multiple users consider one of our Team Membership options. We hope you’ll get so much value from the Academy that you won’t want to cancel, but if at any time you decide Digiterati Academy is not for you can cancel your monthly subscription by simply emailing our support team. We will immediately cancel your subscription and notify you by email. Your annual subscription can be cancelled at any time and you will still enjoy your membership until your 12 month term expires. If I cancel my subscription will I lose access to the Academy Masterclasses and Courses? You retain access for the remainder of the month (or year) you have paid for, after which time your access will be suspended. If I cancel but later decide to re-subscribe can I get the same monthly rate I was paying? If you were originally subscribed at a special discounted rate you will lose that rate. Your new subscription would be at the rates current at the time. 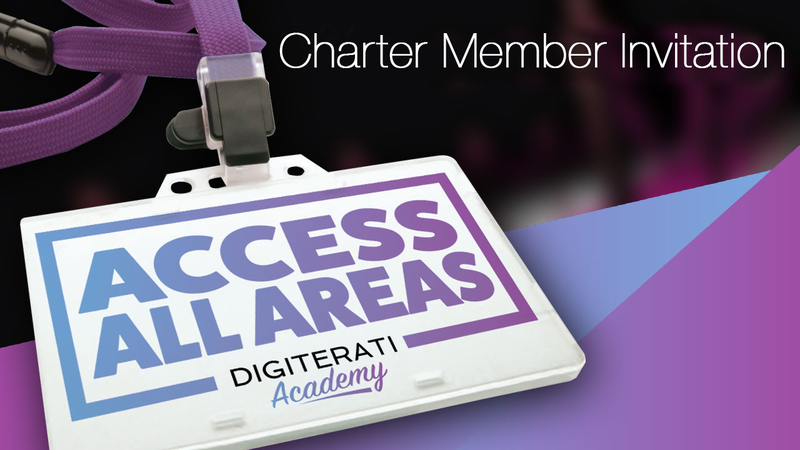 How many courses and masterclasses are there in Digiterati Academy right now? There are 37 Courses and Masterclasses already available within the Academy library. We continually add new material while ensuring we keep the current training updated as platforms and processes change. We are serious about this Academy and know that if we don’t live up to our promises, and your expectations, of fresh and relevant training material you will simply cancel your subscription and leave. Having said that, we also don’t want to scare new members with a huge wall of content! Our intention is to publish new material approximately every month. I see lots of Facebook marketing training in the Academy at the moment. Is Digiterati Academy only about Facebook? In a word, no! We had to start somewhere so we decided to focus initially on Facebook training because of market demand for this and our belief that Facebook represents the best opportunity for businesses right now. What other areas will you be covering in future? We have a vast range of Masterclasses and Courses in the pipeline covering Snapchat, LinkedIn, Twitter, Instagram, Messenger, Content Marketing, SEO, Email Marketing, Social Media Policy, YouTube, Google Analytics, Wordpress and much, much more. We’ll also invite our members to suggest new courses and vote which ones they want first. At the end of the day we exist to serve YOU our members. Can I contact you to suggest new training course ideas? Absolutely! We are here to serve our members and ensure you're getting the most value from our range of training materials. We encourage members to let us know their priorities and we also conduct regular surveys to gain insight into our members' needs. Can I access this on my mobile device? Absolutely! Digiterati Academy works seamlessly on desktops, laptops, tablets and smartphones. The only thing you need is an internet connection. How is this different to other providers such as Digital Marketer / Smart Insights / Lynda / Udemy and similar? Good question! It’s a confusing market! Digital Marketer and other digital marketing publishers are great sources of marketing advice but mainly focus on theory, strategy and process. Digiterati Academy differs by providing frequently updated training with step-by-step practical and actionable learning outcomes using the very latest techniques. Lynda and Udemy offer a vast range of training types (not just marketing training) so their focus isn’t as sharp as Digiterati Academy. Many of their courses are based around learning the "fundamentals" which, while very useful, do not take account of the latest developments and techniques hence many of their courses can be outdated. Digiterati Academy’s content is always at the leading edge and frequently updated. We truly believe Digiterati Academy to be unique in the marketplace. Can my organisation issue a purchase order and you send us an invoice? If your organisation would prefer to issue a purchase order for an annual subscription we will gladly send you an invoice. However, your access will only commence on receipt of payment. This payment option is not available on monthly subscriptions. In addition we are unfortunately unable to honour the 2 free month offer on annual subscriptions which are billed via proforma invoice due to the additional administration involved. We will email you a receipt for your payment(s) immediately after purchase. For monthly or annual subscriptions you will receive an emailed receipt for each payment. Do you charge VAT, VAT MOSS or Sales Tax? No. We are currently exempt from VAT, VAT MOSS and Sales Tax. The price you see for our courses and subscriptions is the price you pay.